One of the largest Carcoon’s produced now houses the Leyland Atlantean double-decker bus known as the ‘Peace Bus’. 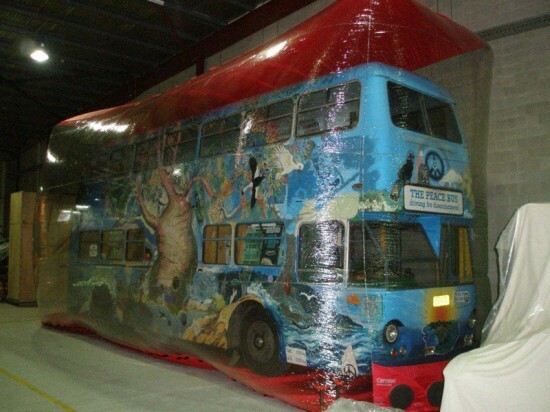 The bus was purchased in 1982 by the People for Nuclear Disarmament from the NSW Urban Transport Authority. It operated as a mobile PND education centre, promoting the cause of nuclear disarmament and world peace. The bus travelled over 24 000 km and was visited by more than 40 000 people between 1984 and 1987. When not on public display the Peace Bus will be protected in its Carcoon, keeping it preserved for future generations.